Sharon Rae Hyder: My art career started back in the days when homes had old fashioned pull shades at the windows. I looked at these shades longingly thinking that they would make wonderful canvas' to paint on. My parents had observed my youthful talent at drawing and the grades I was getting in primary school so they bought me a small set of oils and one brush. Then my parents decided to get all new blinds and gave these old pull shades to me. I was overjoyed to have rolls and rolls of canvas to practice on. I continued to paint and draw throughout school and loved high school art classes. Besides oils I delight in ink, pastels, acrylic and charcoals. One class project was a 16"x 20" oil of a lonely palm at age 15 that won the class award. Fifty years later I did another palm 2-1/4' x 3' acrylic, called "Ode to the Palm" as a tribute to my art career. They both hang in my gallery today. In 1958 I took an art talent test for a correspondence art school and scored an A- This inspired me to go forward with my art. I took every art class available to me. In 1979 - 1984 I taught Art at Volusia County Private School Systems and then from 1984 - 1987 at Wise Independent Private School, both in Daytona Bch, FL. I Founded "The Artist's Loft Inc." in Wise County VA. This was a school for an introduction to Art techniques, Color, Drawing and Design. I taught Beginner, Intermediate and Advanced Classes. In the summer of 2002 I was Art instructor and set plan designer for the University of Virginia College at Wise. This was a Pro Arts Creative Art Summer Camp. The play "Annie" was presented and for the first time in the 27 year history of the camp the students participated in painting the backdrops and props for the show. I researched, designed and orchestrated the entire stage scenes. It was a grand success. From January 2010 to October 2011 I shared a studio with my daughter Lori Anne Harris at Gallery on First. We became known as the Mother and Daughter "MAD about Art" team. This experience opened many doors for us. I began teaching at our small studio and gained many students. My son Andrew Dean Hyder moved to Florida from Minnesota due to his father and my husband's ailing health and this opened yet another door. We put all our talents together and decided to open our own gallery and training center. 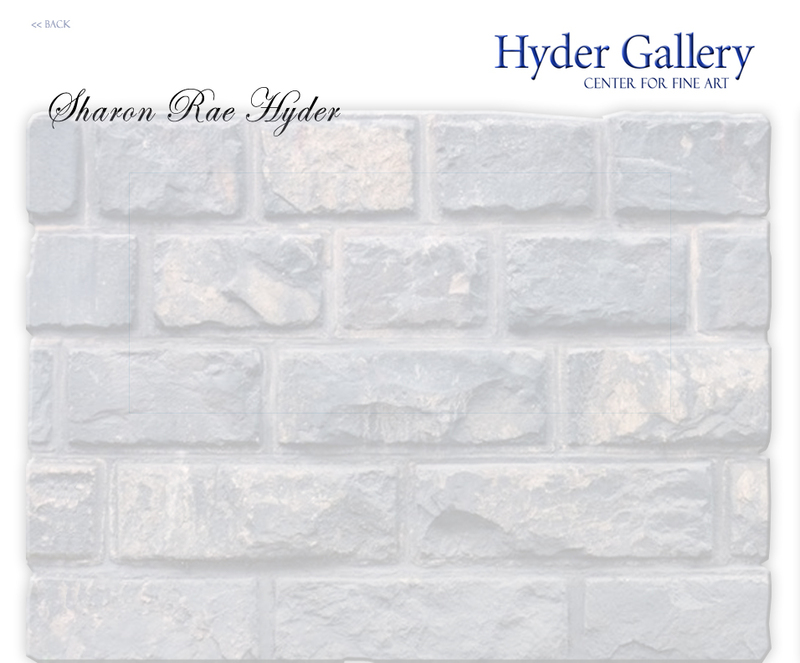 "Hyder Gallery Center for Fine Art". November 5th 2011 was our grand opening. It is truly a center for education and fun. Classes and workshops are taught on a regular basis. With 5 professional instructors, the Center teaches all the essentials necessary to begin or expand an art career. Instructional courses are given on materials, color, and use of texture, proportion, symmetry and perspective. Artists learn how to conceptually and practically create art that has his/her "voice" (the artist "signature"). The Center also teaches the business of art marketing and creative methods used by some of the most successful modern day artists. One of the Gallery/Center's chief aims is to discover and foster new local talent and propel them into the art scene. To that end, the focus of the Gallery's exhibition will be on the raw talent found in work submitted, not necessarily on an artist's resume or historical success. I would like to add that although I obtained degrees in Business, Accounting and Finance and still run a small Accounting Practice my love of the Arts has always been a part of my life. "To teach my love of art to others is a heartwarming and rewarding effort, and to have my paintings, murals and sketches owned and loved by many throughout the years makes me very proud". This is an original work. 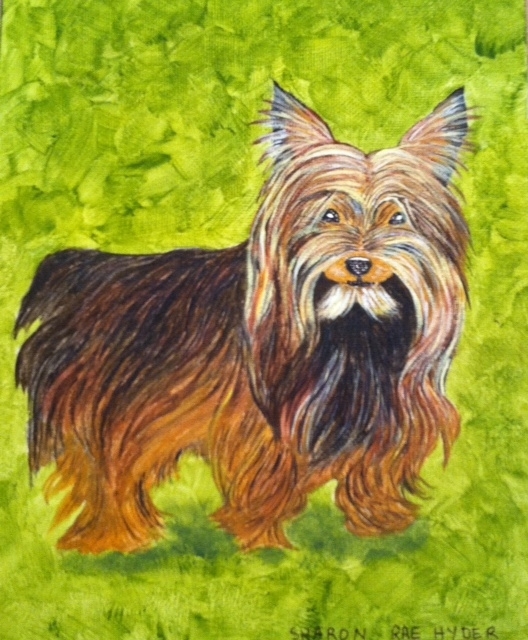 Height 12" x Width 9"
Inspired by a blind little Yorkie. Sharon Rae Hyder Professional Artist Sharon Rae Hyder: My art career started back in the days when homes had old fashioned pull shades at the windows. I looked at these shades longingly thinking that they would make wonderful canvas' to paint on. My parents had observed my youthful talent at drawing and the grades I was getting in primary school so they bought me a small set of oils and one brush. Then my parents decided to get all new blinds and gave these old pull shades to me. I was overjoyed to have rolls and rolls of canvas to practice on. I continued to paint and draw throughout school and loved high school art classes. Besides oils I delight in ink, pastels, acrylic and charcoals. One class project was a 16"x 20" oil of a lonely palm at age 15 that won the class award. Fifty years later I did another palm 2-1/4' x 3' acrylic, called "Ode to the Palm" as a tribute to my art career. They both hang in my gallery today. In 1958 I took an art talent test for a correspondence art school and scored an A- This inspired me to go forward with my art. I took every art class available to me. In 1979 - 1984 I taught Art at Volusia County Private School Systems and then from 1984 - 1987 at Wise Independent Private School, both in Daytona Bch, FL. I Founded "The Artist's Loft Inc." in Wise County VA. This was a school for an introduction to Art techniques, Color, Drawing and Design. I taught Beginner, Intermediate and Advanced Classes. In the summer of 2002 I was Art instructor and set plan designer for the University of Virginia College at Wise. This was a Pro Arts Creative Art Summer Camp. The play "Annie" was presented and for the first time in the 27 year history of the camp the students participated in painting the backdrops and props for the show. I researched, designed and orchestrated the entire stage scenes. It was a grand success. From January 2010 to October 2011 I shared a studio with my daughter Lori Anne Harris at Gallery on First. We became known as the Mother and Daughter "MAD about Art" team. This experience opened many doors for us. I began teaching at our small studio and gained many students. My son Andrew Dean Hyder moved to Florida from Minnesota due to his father and my husband's ailing health and this opened yet another door. We put all our talents together and decided to open our own gallery and training center. "Hyder Gallery Center for Fine Art". November 5th 2011 was our grand opening. It is truly a center for education and fun. Classes and workshops are taught on a regular basis. With 5 professional instructors, the Center teaches all the essentials necessary to begin or expand an art career. Instructional courses are given on materials, color, and use of texture, proportion, symmetry and perspective. Artists learn how to conceptually and practically create art that has his/her "voice" (the artist "signature"). The Center also teaches the business of art marketing and creative methods used by some of the most successful modern day artists. One of the Gallery/Center's chief aims is to discover and foster new local talent and propel them into the art scene. To that end, the focus of the Gallery's exhibition will be on the raw talent found in work submitted, not necessarily on an artist's resume or historical success. I would like to add that although I obtained degrees in Business, Accounting and Finance and still run a small Accounting Practice my love of the Arts has always been a part of my life. "To teach my love of art to others is a heartwarming and rewarding effort, and to have my paintings, murals and sketches owned and loved by many throughout the years makes me very proud". We have many payment options and will contact you personally to arrange sale and delivery (and installation if you wish) at no extra charge. Your information will remain confidential.